Home » Salaman, R. A. 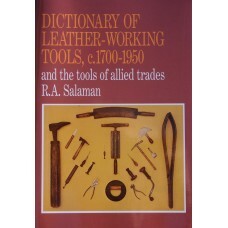 Dictionary of Leather-Working Tools. No Leatherworker cab do without Salaman, R. A. 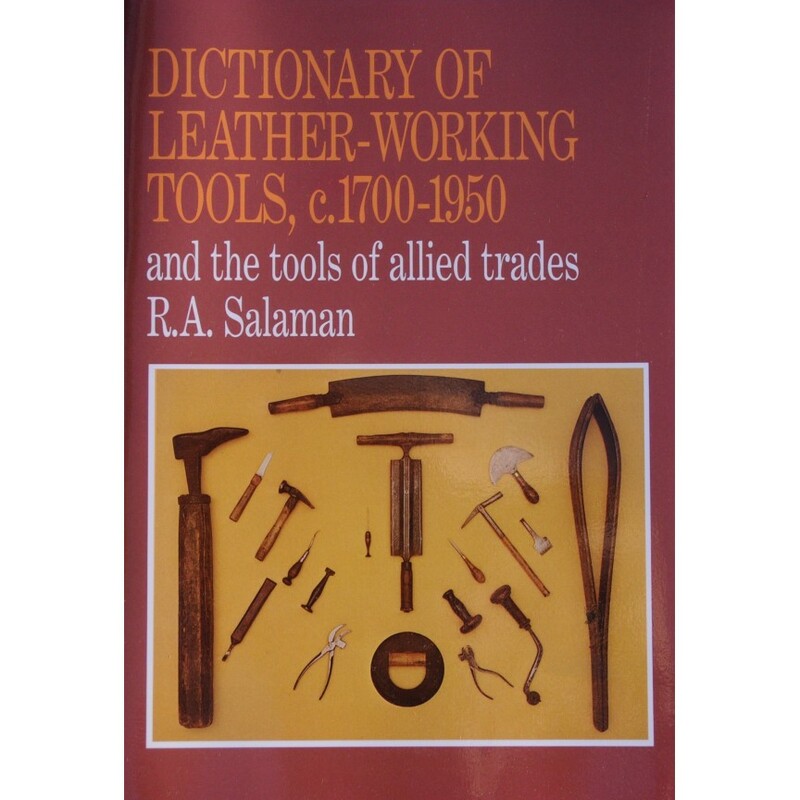 Dictionary of Leather-Working Tools, which, with Geo. Barnsley & Sons of Sheffield, and Hale & Co., are the most impoirtant preservers of the true tradition of Leatherworking in all of its branches. Many of the Leatherworking Tools described in Salaman are available through Hale & Co.
Set of 6 General-Purpose Leather Awls. General-Purpose Leather Needles. Number 00. General-Purpose Leather Needles. Number 0. General-Purpose Leather Needles. Number 1. General-Purpose Leather Needles. Number 2. General-Purpose Leather Needles. Number 3. General-Purpose Leather Needles. Number 4. Set of 6 General-Purpose Leather Needles. Set of 5 Packing Needles. Right-Hand 10-inch Bevel-Point Paring Knife. 8-3/8-inch European-Style Clip-Point Knife with 3/4-inch-Wide Straight Blade. Spirit Lamp with Stand for Tools. Replacement Blade for 5-inch Plough Gauge. Set of 5 Stabbing Awls. 2-inch Cutdown McKay Stitcher for Cowboy Boots. Set of 4 Leather Rasps. Shoe Scraper. No. 2. 3-1/4-inch. Set of 11 Inseam Awls. 3-inch Convex Indian Shoe Knife. Pine Resin. Natural. 1 lb. 5-oz. Standard Cutdown Glazing Iron. Currier's Sleeker Handle with Your Choice of Sleeker Blade. 10-inch Single-Pronged Tanner's Hook Mounted on 6-foot Ashen Pole. 3-inch Sheepfoot-Point Mill Knife with Flat Handle. 2-1/2-inch Sheepfoot-Point Mill Knife with Round Handle. 3-1/2-inch Sheepfoot-Point Mill Knife with Flat Handle. 4-inch Sheepfoot-Point Mill Knife with Flat Handle. 4-1/2-inch Sheepfoot-Point Mill Knife with Flat Handle. 5-inch Sheepfoot-Point Mill Knife with Flat Handle. 3/4-inch Left-Handed Standard Drag Knife. 7/8-inch Left-Handed Standard Drag Knife. 1-1/4-inch Left-Handed Standard Drag Knife. 1-1/2-inch Left-Handed Standard Drag Knife. 5/8-inch Left-Handed Half-Moon Drag Knife. Set of 5 Eyelet Plyers. with Replaceable Eyelet Bit and Copper Bed. 8-3/8-inch European-Style Clip-Point Knife with 3/4-inch-Wide Curved Blade. 8-3/8-inch European-Style Clip-Point Knife with 1-inch-Wide Straight Blade. 8-3/8-inch European-Style Clip-Point Knife with 1-inch-Wide Curved Blade. 12-inch European-Style Clip-Point Knife with 7/16-inch-Wide Straight Blade. 12-inch European-Style Clip-Point Knife with 1/2-inch-Wide Straight Blade. 12-inch European-Style Dagger-Point Knife with 3/4-inch-Wide Straight Blade and Rounded Heel. 12-inch European-Style Dagger-Point Knife with 3/4-inch-Wide Straight Blade and Half-Bevelled Point. 12-inch European-Style Heavy Sheepfoot-Reverse-Point Knife with 1-inch-Wide Blade. 18-inch European-Style Heavy Sheepfoot-Reverse-Point Knife with 1-inch-Wide Blade. Set of 5 Upholsterer's Packing Needles. 2-3/4-inch Upholsterer's Curved Sewing Awl with Eye in Bend of Shank and Oval Point. 2-7/8-inch Upholsterer's Curved Sewing Awl with Eye in Bend of Shank and Oval Point. 3-inch Upholsterer's Curved Sewing Awl with Eye in Bend of Shank and Oval Point. 3-1/8-inch Upholsterer's Curved Sewing Awl with Eye in Bend of Shank and Oval Point. 3-3/16-inch Upholsterer's Curved Sewing Awl with Eye in Bend of Shank and Oval Point. 3-1/2-inch Upholsterer's Curved Sewing Awl with Eye in Bend of Shank and Oval Point. 3-5/8-inch Upholsterer's Curved Sewing Awl with Eye in Bend of Shank and Oval Point. 3-3/4-inch Upholsterer's Curved Sewing Awl with Eye in Bend of Shank and Oval Point. Set of 8 Upholsterer's Curved Sewing Awls with Eye in Bend of Shank and Oval Point. Spare Blade for 1-inch Lace Cutter. 2-1/2-inch Upholsterer's Straight Sewing Awl with Eye near Oval Point. 3-inch Upholsterer's Straight Sewing Awl with Eye near Oval Point. Shoe Scraper. No. 1. 3-1/4-inch. Shoe Scraper. No. 6. 2-inch x 4-inch. Shoe Scraper. No. 6. 5-inch x 2-1/2-inch. Shoe Scraper. No. 6. 3-inch x 6-inch. Shoe Scraper. No. 7. 2-1/2-inch. Shoe Scraper. No. 8. 3-1/2-inch. Shoe Scraper. Curved Top. 4-inch x 3-inch. Set of 9 Shoe Scrapers. 3-inch Single Straight Hook Awl. 3-1/4-inch Single Straight Hook Awl. 3-3/8-inch Double Straight Hook Awl. Upholsterer's 3-1/4-inch Middle-Curved Sewing Awl with Longitudinal Groove in Shank. Upholsterer's 4-inch Sharp-Curved Sewing Awl with Longitudinal Groove in Shank. 10-inch Tanner's Standard Pulling Pincers. 10-inch Tanner's Stretching Pincers with Meshing Teeth. 3-3/4-inch Small Chuck Awl Haft. Patented. Salaman, R. A. Dictionary of Woodworking Tools. Second Edition. 1997. 13-3/4-inch Shoulder Vein Screw Creaser. RARE! Only 4 Available.